What I like to do in Tokyo is to get away from the main shopping areas and wander into the less-known neighborhoods, which in my mind must look more like Tokyo used to be. I wish I traveled there not just ten years before they shot « Lost In Translation » and made Tokyo a cliché, but back in the 60’s or 70’s, when photographers were taking distorted black-and-white nudes, Hondas were small and painted mustard yellow, orange or pea green, and the « modern » women wore strict European dresses and listened to classical music in dark hi-fi parlour in the afternoon. I soon found myself walking down Jinbo-cho, which is the second-hand bookstores district. It’s a bit like the Strand in New York, if the Strand was laid flat on its back and splitted in hundreds of small shops, with piles and piles of books on the sidewalk. This is when my eyes caught the window of an old-fashioned eyewear shop. 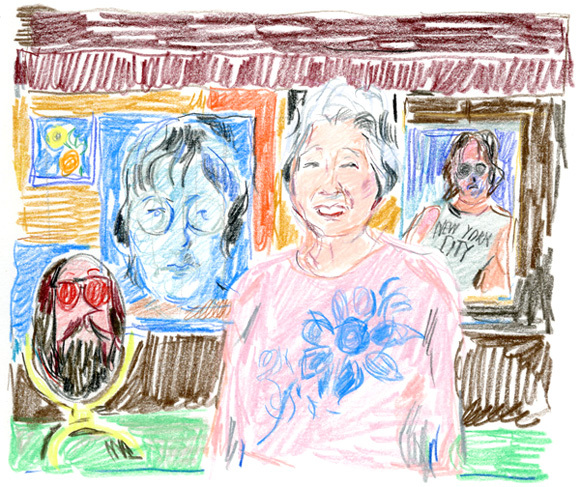 On display were faded photographs of John Lennon and round-shaped spectacles, all displayed on emerald green and flesh-pink satin. The shop was a happy clutter inside and seemed untouched since the late 70’s, with more John Lennon posters and more vintage Lennon spectacles. There were collections of old optometric paraphrenalia, and an old, abandoned VCR, which I suppose once played Lennon’s tapes. 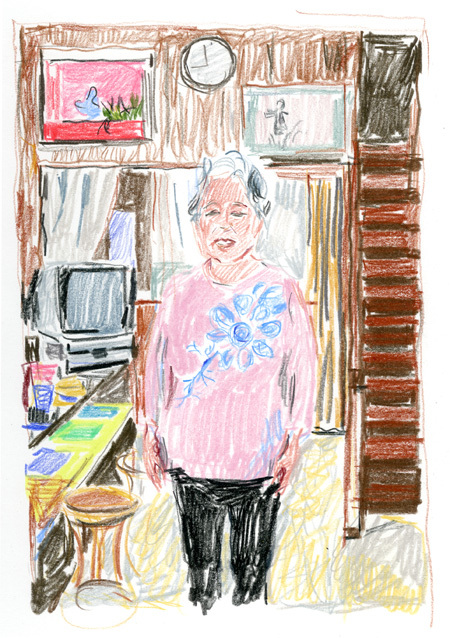 A lady came down the wooden stairs, inquiring in Japanese. Soon it was obvious that we couldn’t communicate, besides nodding and smiling to each other. – So you must like John Lennon very much, I articulated with my French accent, in a last attempt, actually hoping she would not understand such a tired line. She took a cell phone, dialed a number, and after briefly speaking into it, passed it on to me. A man’s voice spoke a few English words, with a noisy crowd in the background, which made him even more difficult to understand. – I wanted to tell the lady that it’s a lovely shop, I shouted. – I would like to know the name and address so I could write it down in my blog..! I was thinking of you, dear readers, at this particular moment (although perhaps hundreds of bloggers and guides might already have listed this information), but finally had to admit to myself that the conversation was going nowhere, with the crowd in the background of the cellphone getting louder. Maybe he was off betting somewhere, or in a busy railway station. I bowed, and retreated to the door. On my way out, I stopped in front of a framed picture of a white dog. – Your dog…? Lovely dog ! 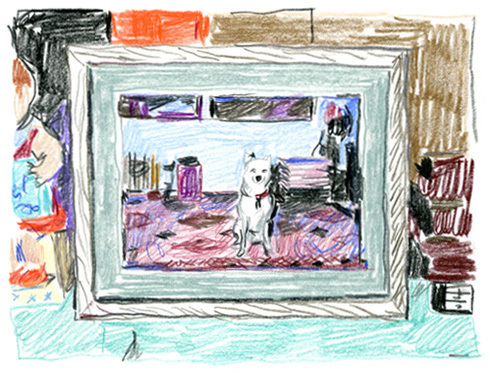 But didn’t insist, thinking that the fact the dog’s picture was framed meant he might not be there anymore. I bowed once more, and was out. In a time when everybody is willing to sell his soul in a minute in fear of being out of date, such faith and fidelity should be praised. I think it’s true gentleness. 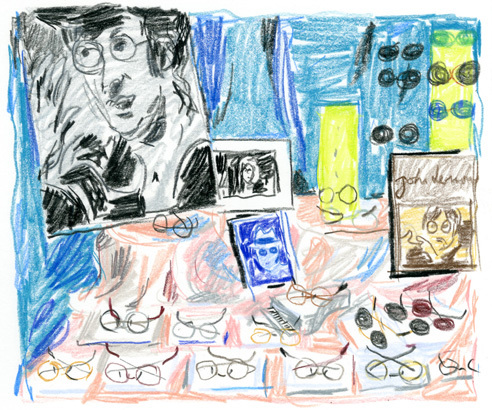 And if only I have had access to this shop when I was a young kid, when I was craving Lennon glasses. Lovely writing and drawings. What a wonderfully odd shop. J’aimerais bien mimer une carte de visite moi aussi. C’est à des talents comme ceux-là qu’on reconnaît les vrais globe-trotters. I love your blog, you are so charming. I feel the same way about tokyo, about odd, trapped-in-time shops, and about fear of being irrelevant. Just found your blog. Love your sketches/pictures, and envy your journey to Japan – being a Japanophile since childhood. 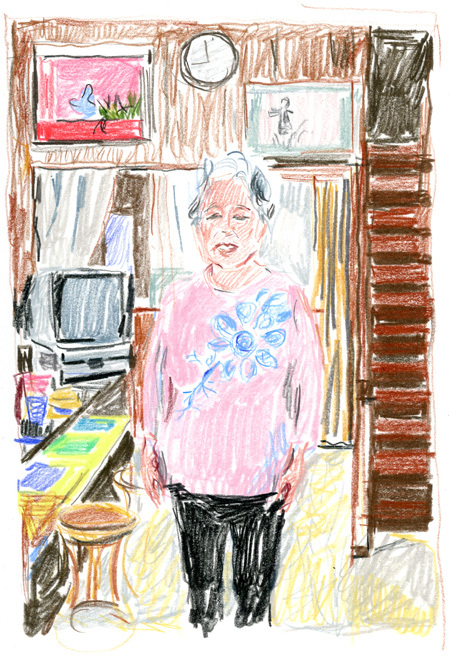 I worked for a Japanese family for a while in college, and sometimes nodding, smiling, and bowing is the best on can do.